Just my idea.. but I would grab a bottle of isopropyl alcohol / rubbing alcohol from the drug store or Walmart and wash down the lid with that! Use a clean rag and lots of it and that will act as a degreaser and dryer to leave the finish close to the original faded finish. Wash the whole lid to make sure you don’t have 1/4 that is cleaner than the rest. The problem you have is the oil is like a moisturizer the same as car wax on an old faded red car. Use the alcohol to remove the oil without doing any other damage and it should return to good old “old”. New member here, just restored a 2002 18" Kettle. 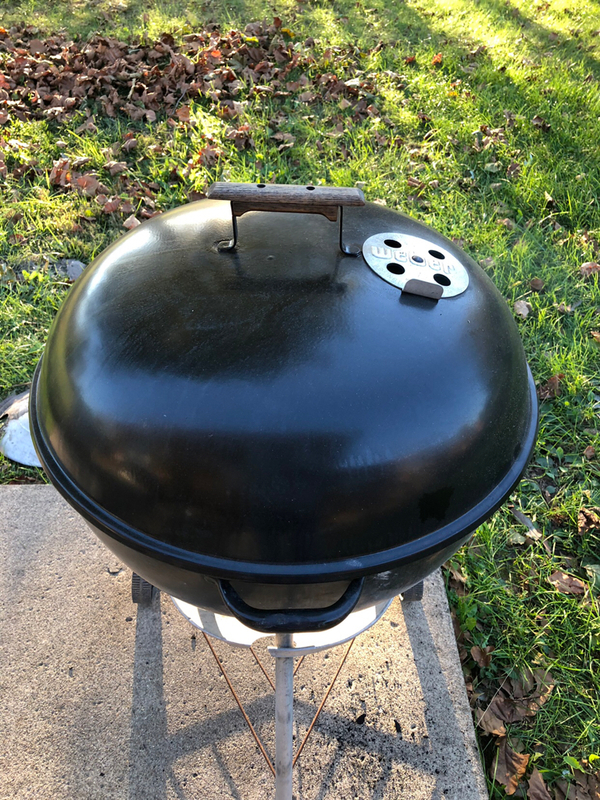 I'd seen your post, thinking that perhaps to get the shiny exterior back on my grill I'd try your mishap and apply cooking oil to the lid while hot. 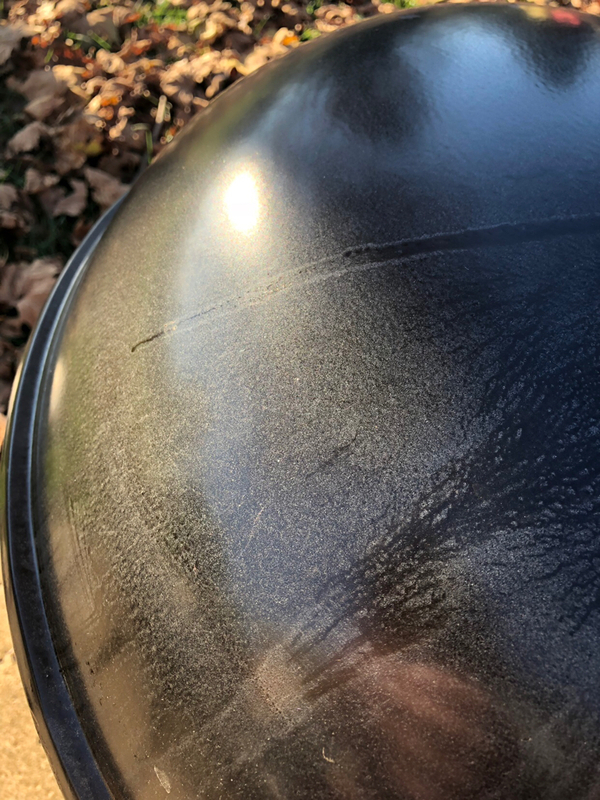 Well, during last night's (second) cook I managed to spill oil on the lid, resulting in a shiny spot very similar to yours. OK, so now it's got me irritated. I've been growing accustomed to the haziness and would prefer the entire lid to look that way. This morning, I figured I'd give the degreaser recommendation a try. What harm could it do? It might work, it might do nothing or it might make things worse and I'd wind up applying cooking oil. Here's the stuff I have on hand, it's a generic version of Simply Green, available at Lowe's. 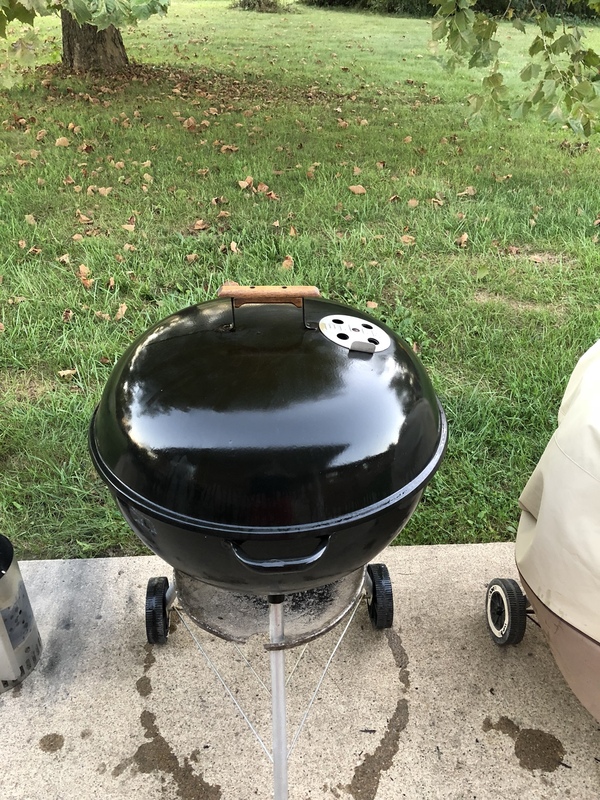 I applied some to a cotton cloth and applied it multiple times to the entire lid (grill was cold). This stuff did the trick! I wish I had before pics of the shiny blemish, but I don't. In this after shot, you can barely make out where the shiny spot was, under my reflection. I still have a small area under the handle that I need to work on. It's difficult getting decent pics to show the area with the sun. I actually kind of like the "dust covered" look of the patina. Just figured I'd chime in here with my recent observations. As soon as I get a chance I'll post a thread on my restoration. There's a thread I've posted over in bbq brethren about it. She’s a looker for sure. Thanks for the tip and welcome to the club! How long will the pam job stay? Nice! I'm sure it will even out with time. Looks great. Hopefully it works. I'd be unhappy too, if that happened to mine. I have no idea. I’ll do my best with this. I’ll make my A code my primary cooker and leave it uncovered. I’ll try to take a pic every month and post them to this thread. Man, the cooker really looks good. Hard to say it was a mistake, when it looks like a blessing. She did make us some good chops tonight.